Piazzale Michelangelo is “the place” for a panoramic view of Florence. While the views are stunning during the day, it becomes even more popular later in the day as people gather to watch the sunset over the city. 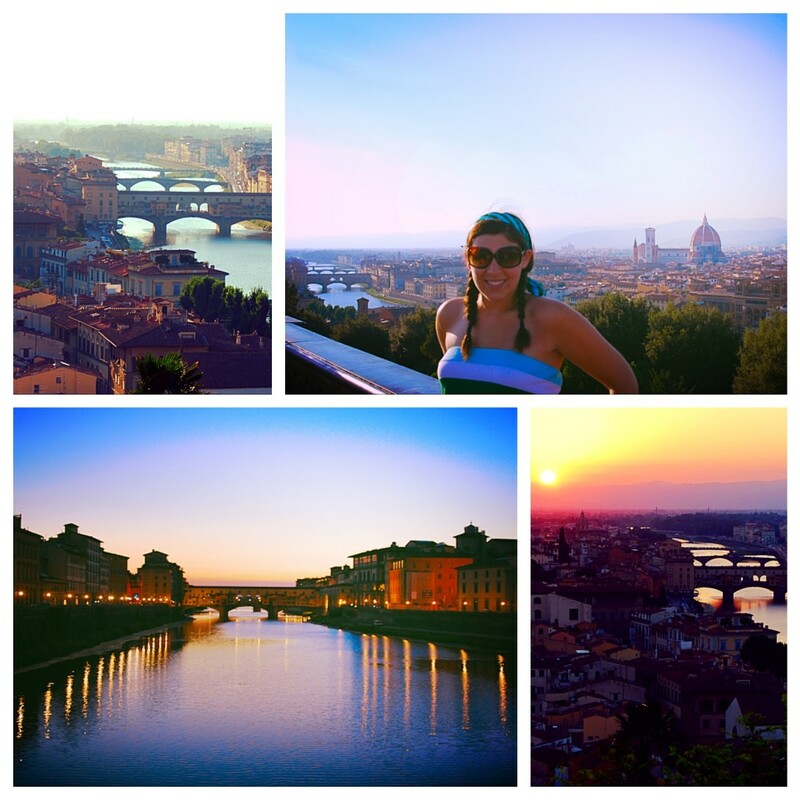 The Duomo, the Arno River, and the famous Ponte Vecchio are all within view. The piazza is seemingly made for this with steps that provide an amphitheater of sorts for this magical time of day. My siblings had joked with me about singing on the streets during our backpacking trip through Europe but I had yet to do it. At the urging of my brother I decided this was one of the most ideal times and places to perform. Quite a crowd had gathered and there is not much for everyone to do but wait for the sun to set. I quickly made a set list in my head before taking his white hat and walking down the steps. I knew one song that absolutely had to be sung. “O Mio Babbino Caro” from Puccini’s opera Gianni Schicchi refers to the very river, the Arno, and bridge, the Ponte Vecchio, that were before me in that very moment. I turned around and faced my “audience.” I set the hat on the ground and began. It wasn’t long into the song that everyone started to pay attention to me. I had a captive audience. The song ended and I breathed a sigh of relief as everyone started clapping. They liked it! I headed right into the next song, “Porgi, amor” from Mozart’s Le Nozze di Figaro. At the end of the song, someone came up and dropped a five euro note in the hat. Not bad! That definitely gave me some motivation to continue! I sang through my “set list,” probably 30 minutes or so. During the time I was singing people had come up and dropped coins in and a few notes here and there. I thought that was nice. It would pay for dinner that night or maybe a gelato or two. I gathered the hat and headed back up to the stairs to enjoy the sunset myself. When I got around to counting all the money, I quickly realized that I shouldn’t have been so dismissive of the clinking of coins. With 1 and 2 euro denominations being in coin form, the total can quickly add up! When all was said and done, I have collected over 100 euros! I was shocked. Not only would this cover dinner AND gelato, it would cover my hostel stay for several nights! My success in Florence prompted me to try again in Venice. I sang one night on a bridge but that didn’t last song since a torrential downpour came out of nowhere. I tried the next day near the Doge’s Palace, adjacent to St. Mark’s Square. This time though, I upped my game and went back to the hostel to put on a dress. When I sang in Florence I had been sightseeing all day so I had on shorts and tennis shoes. I tried to keep it classy and wore the nicest thing I had in my pack. With my hat in tow, I set up shop and drew a little crowd. The tips started coming in and this time I started getting requests! I had a girl come up and ask me if I knew “Addio del passato” from La Traviata. I think a lot of tourists thought I was Italian. Up to that point, many Italians had thought I was Italian so it wasn’t surprising. Combine that with the fact that the majority of the songs I was singing were in Italian. I didn’t say much because I didn’t want to ruin the illusion so I just kept saying “grazie” to everyone who came by to drop something in the hat. Overall, my introduction to busking, or street singing, was extremely uplifting. People are receptive to others sharing their talents. Once I got over that initial fear of how people would react to me, I realized that I should take advantage of any opportunity I have to share my voice. All I can hope is that I brightened someone’s day. I like to imagine that someone was visiting Italy for the first time and they’ll remember that one day they sat on the steps at Piazzale Michelangelo and an Italian girl sang opera as the sun set over the Arno. Newsies! Read all about it! 2 Comments on Cantando in Italia! A very well written web site and individual postings.